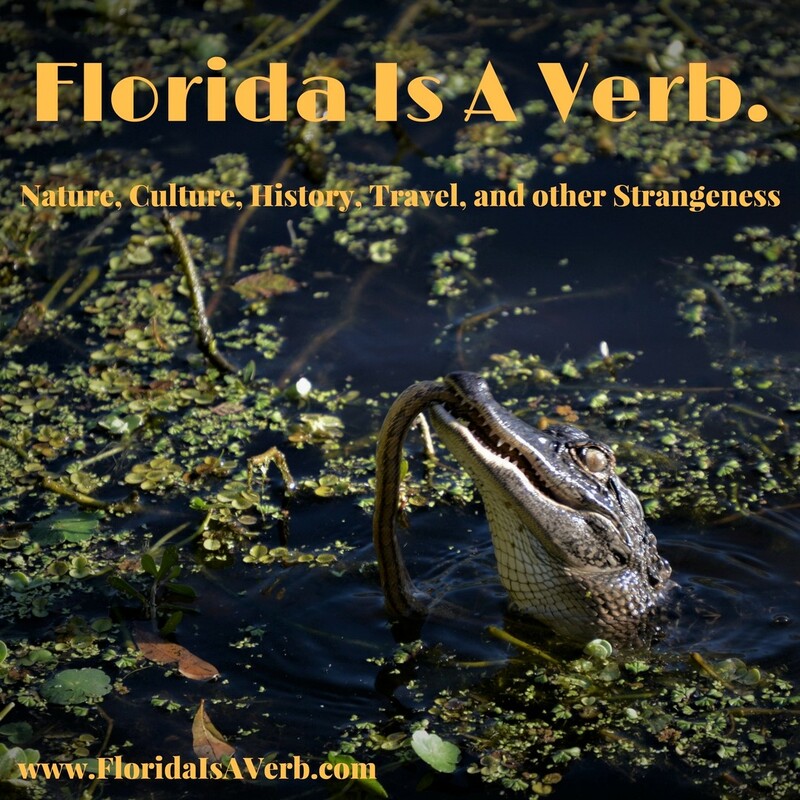 I created Florida Is A Verb as an excuse to write about things that I love, and to also try to capture an image of my home that often seems to be missing. Florida is usually depicted in one of two ways—it’s usually either the glossy theme park and cruise ship brochure version, or the “look how backward and fucked up this place is, hahaha!” police blotter version, and while those are aspects of Florida, they’re 2-D versions that fail to capture the difficult realities—the real beauty as well as the madness. Of course, trying to portray it all, or even just trying to hold it all in your mind- this world built on top of a constantly shifting landscape populated by con artists, dreamers, outcasts, venomous snakes, and people who (like me) just can’t seem to live anywhere else- is extremely difficult, and capturing the dizzying Rorschach landscape of cities, sprawl, and wilderness is nearly impossible. For a while now, I’ve been keeping a running list in my head of the books that get it right, that capture, if not the whole reality, something resembling the feel of the place. So here’s my first (nowhere near complete) attempt at a ‘Sunshine Syllabus,’ a reading list for anyone looking to have a deeper understanding of this beautiful and terrifying peninsula. Consider this Part One of a Florida education- these are the visions of old Florida, as it was before Theme Parks and cruise ships-- it is by no means complete; I’ll be adding more soon. I’m listing this first because it is probably the best book about Florida ever written and is an excellent place to begin. Stetson Kennedy is the rare example of a writer and academic becoming a full-fledged folk hero. He’s best known for infiltrating the Ku Klux Klan in Georgia and turning Klan secrets over to law enforcement, human rights organizations, and the writers of the Superman radio series (who then produced a series of episodes that mercilessly shamed and ridiculed The Klan). Palmetto Country is the result of Kennedy’ travels around Florida while working as a folklorist for the WPA in the 1930’s. It’s a collection of oral histories, stories, songs, pictures, and poems from that specific time and place. The book works as an excellent primer to the Florida of the past, as it existed before it became a vacation mecca. Kennedy’s book preserves Florida’s long-gone turpentine camps, juke joints, fishing villages, and farms. It’s compulsively readable, and just packed with beauty. Of special interest (to me) is its last 50 pages, largely a collection of stories of the strikes and activism of the Ybor City labor movement. This book begins “There Are No Other Everglades In The World” and without this book, it’s very likely that there would be no Everglades at all. River of Grass is one of those books that had a direct and immediate social impact, that likely saved the Everglades from being drained and paved to become another Miami suburb. Beyond this, River Of Grass is a poetic vision of the natural and human history of a uniquely Florida ecosystem, and a beautifully written argument for preserving the State’s natural spaces. I first read The Yearling in parts as a kid- some of the excerpts were required reading when I was growing up. I don’t remember it making much of an impression on me—as I always had problems with authority, and anything I was ‘supposed to’ read just kind of grated me (While I devoured pulp Sci-Fi and Mad magazine). I read the yearling in its entirety for the first time about four years ago, as part of a book club themed around ‘things we should have read by now.’ I don’t know what it’s like for a kid, but reading the Yearling as an adult is a devastating experience. It’s best known for its depiction of rural Florida homesteading and of the landscapes of what is now the Ocala National Forest, but more directly, this book hurts, it hurts a lot- the themes of poverty, desperation, isolations, a difficult family, and ultimately, how growing up means giving up the things you love, still hit very hard. I can’t really say much about this book that hasn’t already been said, but that it is essential to understanding the real complexity of Florida as a mash-up of cultures and ideas. First, it gives us, probably, the best historic depiction of Eatonville, one of several self-governing African American settlements that appeared in Florida in the late 1800’s. Furthermore, while it is a book about black characters in the American South, it is not specifically about racism (though it comes up); It’s about the search for self-determination and identity against a world that can be cruel and uncaring—and maybe most importantly, it’s a love story. To me, this book captures the turbulent, ever-shifting feel of Florida in a way that few do- both in the central love story that is tender and passionate, as well as terrifying- and in the dangerous beauty of the landscape itself. As I said, this is by no means a complete list—in some ways these are just the most obvious choices, and all of these books really only capture a specific kind of old, nearly lost Florida-ness—the sort that is almost gone completely—paved over by suburbs and strip malls. I’ll be continuing the ‘Sunshine Syllabus’ soon, and I’ll include more of the Deep Cuts and more recent creations.